Journalist Jill Abramson participates in a conference at Santa Clara Convention Center on Feb. 24, 2015 in Santa Clara, Calif.
"Though I did cite these publications and tried to credit everybody perfectly, you know, I fell short," Abramson said. Michel Martin: So, let's start with disclosures which, as you point out, is something highly prized in the legacy media, that we worked in the same newsroom at The Wall Street Journal and we did parallel reporting around the Clarence Thomas confirmation hearings and you appeared in a documentary I reported on. So, with that being said, we know each other. Jill Abramson: Well, you know, accuracy and devotion to the truth are so important to me. And I take all of these, you know, allegations of inaccuracy and plagiarism very seriously. When I found the allegations have merit, I have moved very quickly to correct everything including the issue of — the book does not have the wrong gender identity but includes the word transgender in a list of how diverse the Vice staff is. And, you know, I'd like to note that all of these issues are coming from Vice which, you know, is clearly not happy with my portrayal, which I thought was quite balanced and portrayed them as an inventive digital, you know, especially, video news provider of good journalism. Well, even acknowledging that Vice doesn't like the way you portray them as an editor, how would you handle allegations like the ones you're facing if a reporter under your supervision was facing them? I mean, after all, you were executive editor of the Times, you were brought in and after a reporter at the Times Jason Blair was discovered to have made stories up. I mean, this is not the allegation here. This completely different. But Vice's Michael Moynihan has pointed out he's tweeted several passages, numerous passages, that he says we're just too close to things that were written elsewhere, like in Columbia Journalism Review, for example. So even accounting for the fact that, let's say, Vice doesn't like your coverage — those are the passages that they've put before the public to discuss. What do you say about that? Well, the way I responded is the way I would expect anyone at The New York Times, or any good journalist, I am scrutinizing everything. And being open and transparent when I have been wrong and corrected anything that I found to be an inaccuracy including some of the things you mentioned. And in terms of the six passages that Michael Moynihan highlighted on Twitter, you know, I've looked at each and every one — and my book has 70 pages of footnotes. You know, the citations for Vice, the three Vice chapters are, there are nearly a hundred source citations and the very news organizations that he lists alongside these quotes are ones that are cited in the footnotes. You know the New Yorker story, the dissertation he talks about, Ryerson review. You know there's a journalist he names. There's a freelance journalist who wrote a profile about Vice's Thomas Morton, he was profiled by a freelancer named Ian Frisch for a magazine he founded called Relapse. That magazine is now defunct. But he says, also, that he feels that there were passages that were uncomfortably close to those that he had written before. And your response to that is? You know, I've looked at them and in several of these cases the language is too close for comfort and should have been specifically cited in the footnotes correctly. I'll explain to you why they weren't or put in quotations in the book. And you know what is the problem here is that, though I did cite these publications and tried to credit everybody perfectly, you know, I fell short. And in the cases that Michael Moynihan cited there isn't the correct page number for the credited citation. And I'm going to fix those pronto. And, you know, I'm determined to make my book flawless and we'll fix these things as, absolutely, soon as I can. Well, I think one question might be why did these errors happen to begin with. I mean, given that the subject of your book is about the difficulty and the cost of producing high-quality journalism in a current moment that that highly prizes speed sometimes over accuracy, and highly-prized eyeballs and aggregation sometimes, in your view, over accuracy — I mean this is a book and the timetable presumably, was your own, so what's the issue here? Well, the issue here is it's a 500-page book and these are a few problems in it. And you know, as I've spent many hours scrutinizing how this could have happened I've gone back through my drafts there, I went through numerous drafts of chapters that I wrote. I had a lot of outlines. You know, this is all factual material in these quotes, it isn't original ideas or analysis and, somehow, in what I was working off, of these particular fact sets weren't highlighted as being from one of these sources, even though I'm completely transparent about the fact I relied on these sources and I credit them. You know, it's a very interesting question that I will give a lot of thought to. And perhaps that's right. But I did have fact-checking I did have assistants in research and, in some cases, the drafting of parts of the book, so I feel I did have support. I certainly did spend money. But, you know, maybe it wasn't enough. You might indeed have a point there. So, let's talk more about the substance of the book. I mean you've lived through this era when newspapers that had traditionally relied on classified advertising and other forms of advertising, advertising from retailers — all of those business models were kind of thrown up into the air. Retailers were not spending as much money on advertising – that's the digital disruption that we now know so well. Do you remember a moment when you realized that this was happening — that the world was really changing? This wasn't small. This was really changing kind of the entire universe. Do you remember a moment when that when you realized that? Well, I think everywhere they do. Because even though people's interests and news has intensified and Donald Trump has been a ratings bonanza and a big seller of newspapers and, I bet your listeners have increased, every news organization is still financially challenged. There isn't one business model to fix, fix everybody or serve every news organization. And invariably things like native advertising — which I had qualms about because it mimics the news so closely down to looking like stories and carrying bylines — that's now standard practice at news organizations. They have what is, in effect, ad agencies operating right within the same office space. So yeah. And I don't think I cited Trump, I don't think financial incentives are completely unrelated to why there are so many stories that have Trump and the headline. I don't think it's motivated by — and I did not write in the book that it's motivated by – but I have talked to journalists there and elsewhere who have told me when their stories aren't about Trump, the readership goes way down. And even though the Times now, luckily, relies more on circulation revenue, digital and print, than advertising, which is a reverse of what it had been. You know that. You know reporters and editors and the business side, who's still trying like crazy to get advertising — even though Facebook and Google are eating up most of it — they want a big audience for their news. So this is obviously a very big subject. It's the subject of many panel discussions and lots of colloquia and stuff like that, but, as briefly as you can: How should the press cover [Trump]?. Well, they have to cover him. They certainly don't have to cover every tweet and every statement he makes and, in general — I don't know if you agree with this — but I think too much of the news is reactive to the president and that he is the master of media manipulation from the many seasons he starred on The Apprentice, and that, sure, there's wonderful investigative and enterprise work being done at the Times, the Washington Post, The Wall Street Journal. But on any given day, there are a lot of news stories that I see as reactive. And when we worked at the Journal, with the biggest running news stories, the editors tried to include a lot of different information in a single story that gave readers what they want to know. And now you can go on the apps of the Times and the Post and scroll through two or three screens before you see anything that isn't that Trump. So, obviously, there's a lot more to talk about with your book. And you unpack the reasons for this upheaval, what's behind the upstart business models, what's behind the disruption to the kind of the legacy media institutions. And, so, that's the core of your book. But now after a decade of all of this, via buyouts and layoffs, it's the upstarts. Buzzfeed. Vice, who are laying off staff. And the Post seems to have found stability in the hands of publisher [Amazon founder] Jeff Bezos. But those legacy institutions seem to be doing well. Contrary to what the president calls them, you know the "failing New York Times," they are not failing, they are doing well, Well, and those upstarts who were so critical to the disruption of the traditional business model are the ones that are having difficulties. And I just wondered — and obviously this is all happening in real time. I caught that arc in Merchants of Truth that, when I started the book, I certainly thought these digital upstarts who, I have to say, are now full of innovation and new ways to cover the news and cover subjects intensely that are sometimes ignored by what is called the mainstream news media. But then over the three years that I reported the book — and I reported it exhaustively — there was a role reversal and it's a lesson that I think both of us learned early in our careers that you have to go into every story ready to be surprised and just keep covering the story as hard as you can. And there was that surprise and Vice and BuzzFeed both just announced 250 job cuts, which hit their news divisions, which are loss leaders, basically, very hard. I want to go back to the subject that started our conversation which is all because of the controversy swirling around the book. You suggested that, look, a lot of the criticisms are coming from people at Vice who don't like the way you describe them. There are other critics who seem not to like the tone of your book particularly directed at the newer media organizations. And I wonder what you make of that. I mean, do you think it's generational? I don't and I really don't think the book has that tone. You know, I had the best time reporting on BuzzFeed and talking to people like Thomas Morton at Vice and I had an all-video journalist from the Post come talk to the journalism class I teach at Harvard. So, I just, I don't think that that is a fair criticism. Well, what do you think it's about though? What do you think the pushback is coming from? I mean, there is no journalist who's ever written or been written about who doesn't like something. I don't want to gloss over gender. I mean you were hired in 2011 as the first woman executive editor. You were fired in 2014. You write about this very openly in the book. You acknowledged that you weren't universally popular. You write that "I was seen as playing favorites and being overconfident of my opinions. I had a bad habit of cutting people off and didn't listen enough in short I was seen as pushy. This last perception is a familiar refrain about women in powerful jobs." That's a quote from your book. I do want to ask if you think any of the current controversy is related to gender. You know, when I was fired I never ever suggested I was fired because I'm a woman and, with this controversy, I would say the same thing. I don't think I'm being, my book is being picked apart, because I'm an easier or bigger target because of gender. I have great optimism about the times. And you know in many ways I think Arthur Sulzberger Jr. was the hero of my book because even though we did have some you know staff reductions in the newsroom, he never cut to the point that the Times wasn't the best and a top quality newspaper and great Web site. And that wasn't true at the Post until Bezos came and quote unquote provided the runway. So I love the New York Times. I want it to succeed and continue being, along with NPR — I'm not buttering you up — you know, just the best. And it's an irreplaceable American institution. And the Sulzberger family knows that, cherishes that. And I have great optimism about it. I am because I think the founders of our country enshrined the free press in the first amendment for a reason, because they knew that the public needed accurate information. And news organizations that would hold power accountable. And I'm certain that that's going to continue to be true and is going to last as long as democracy does. Because there is a lot of excellent fact-based news and, in some ways, the fact that trusted legacy news organizations like the Times and the Washington Post are flourishing now is because, I think, people are wary of just getting all their news in their Facebook news feeds because of the great controversies that have swirled around Facebook, some involving real fake news. So I think there is a hunger, and it's intensified right now, for scrupulously factual information and news. I do. You know, I don't think I'm the person to judge what the sum total of your question, but my career has been about facts and truth and my love of journalism and the news and I will do everything within my power to correct anything that is imperfect in my book. Jill Abramson served as executive editor of The New York Times at a tumultuous time for the journalism industry. The rollout of her new book about the industry has also been tumultuous. The book is called "Merchants Of Truth: The Business Of News And The Fight For Facts." In it, Abramson tracks the rise of two significant upstart outlets, BuzzFeed and Vice, as well as the struggles of the two most prominent national papers, The New York Times and The Washington Post, to stay afloat in the digital age. But even before the book went on sale this week, Abramson has been facing charges of inaccuracy and plagiarism. Her publisher, Simon and Schuster, issued a statement calling the book, quote, "exhaustively researched and meticulously sourced" - unquote - but added that, quote, "If upon further examination, changes or attributions are deemed necessary, we stand ready to work with the author in making those revisions." And Jill Abramson is with us now to talk about the issues raised by her and about her. She's with us from our bureau in New York. Jill Abramson, thanks so much for joining us. 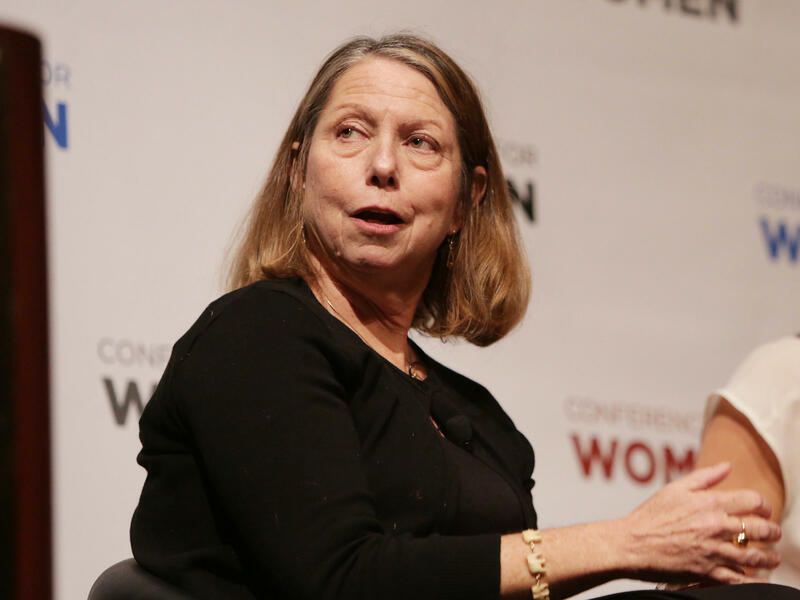 JILL ABRAMSON: Thank you for having me. MARTIN: So let's start with disclosures, which, as you point out, is something highly prized in the legacy media - that we worked in the same newsroom at The Wall Street Journal, and we did parallel reporting around the Clarence Thomas confirmation hearings. And you appeared in a documentary I reported on that subject for ABC News, drawing from your book on the same subject. So, with that being said, we know each other. MARTIN: That being said, we want to get to the substance of the book, but we want to speak to the controversy swirling around its release - allegations of inaccuracy by people that you write about. After reading the galley proof, a Vice journalist said you were wrong about her gender identity and her journalism background. Now, some of those errors were corrected in the final printed work. But she says that other errors remain. A PBS reporter said you misrepresented his decision not to wear protective clothing while covering the Ebola epidemic. The person who reviewed the book for NPR says you made a, quote, "surprising number of errors in your own work." And she said that many of these are quiet but revealing omissions of context. So what do you have to say about that? ABRAMSON: Well, accuracy and devotion to the truth, you know, are so important to me. And I take all of these, you know, allegations of inaccuracy and plagiarism very seriously. When I found the allegations have merit, I have moved very quickly to correct everything. MARTIN: As an editor, how would you handle allegations like the ones you're facing if a reporter under your supervision was facing them? Michael Moynihan has pointed out - he's tweeted several passages, numerous passages that he says were just too close to things that were written elsewhere, like in Columbia Journalism Review, for example. What do you say about that? ABRAMSON: Well, the way I responded is the way I would expect anyone, you know, at The New York Times or any good journalist. I am scrutinizing everything and being open and transparent when I have been wrong and corrected anything that I found to be an inaccuracy. In terms of the six passages that Michael Moynihan highlighted on Twitter, you know, I've looked at each and every one. And, you know, my book has 70 pages of footnotes. The citations for Vice, the three Vice chapters are - you know, there are nearly a hundred source citations. ABRAMSON: You know, I've looked at them, and in several of these cases, the language is too close for comfort and should have been specifically cited in the footnotes correctly or put in quotations. I fell short, and I'm going to fix those pronto. MARTIN: ...For calling the Times' coverage unmistakably anti-Trump. So, you know, there are two questions here. Do you think that the coverage is financially motivated or motivated by business considerations? ABRAMSON: I don't think it's motivated by, and I did not write in the book that it's motivated by. But I have talked to journalists there and elsewhere who have told me when their stories aren't about Trump, the readership goes way down. Reporters and, you know, editors and the business side, who's still trying like crazy to get advertising even though Facebook and Google are eating up most of that - you know, they want a big audience for their news. MARTIN: ...That are laying off staff. ABRAMSON: ...A very bad winter for sure. MARTIN: But those legacy institutions seem to be doing well. And those upstarts who were so, you know, critical to the disruption of the traditional business model are the ones that are having difficulties. And I just wondered - and obviously, this is all happening in real time - is there some bigger story here or a bigger lesson that you draw from these developments about the industry? ABRAMSON: Yeah. That, you know, there isn't a certain survival formula or business model that will ensure every news organization's future. And, you know, right now, yes. The Post and The Times are getting more subscribers. And, you know, it's like having a thrilling, old-fashioned newspaper war all over again. I think it's a hazard to be certain of the future of any type of news organization. But the one thing I'm totally optimistic about is the eternal need for great storytelling and quality journalism. MARTIN: That is former New York Times Executive Editor Jill Abramson. She now teaches at Harvard. Her new book is called "Merchants Of Truth: The Business Of News And The Fight For Facts." Jill Abramson, thanks so much for talking to us. (SOUNDBITE OF GOLDWASH SONG, "BUT U WON'T") Transcript provided by NPR, Copyright NPR.